I’ll be racking up some airmiles over the next couple of months, traveling to present at a series of excellent events. The most valuable thing I take out of being part of these events is meeting interesting people. If you are going to be around for any of these events and would like to meet for a beer – please don’t hesitate to get in touch. On Wednesday I had the chance to talk at Flashbelt, a web media conference that I have been presenting at every year since 2004. I talked about data – how to get it, how to use it, and how & why it’s becoming more and more a part of our lives. I walked through some of the process behind my NYTimes API visualizations, my recent Wired UK NDNAD piece, and Just Landed. I really enjoyed giving the presentation, and it was great to speak to a lot of interesting people at the conference before and after the talk. As promised, I’ve posted a .ZIP file with some simple Processing files to get you started exploring with the NYTimes ArticleSearch API – the link for that along with some other resources that I mentioned during the talk are listed below. Some of you may be aware that this year’s Flashbelt conference ‘featured’ a controversial talk by Hoss Gifford. I’m not going to talk about my reactions in detail in this post as my intention here is to simply share some information related to my presentation. However, I will say that I believe that there is no room at all for content that is in any way demeaning to women at Flashbelt or at any other event. It’s inexcusable. I’m saddened that this happened – but was heartened this morning to read this very thoughtful response and call for discussion from conference organizer Dave Schroeder, along with some of the people who very rightly brought this issue to a public stage earlier in the week. It’s well worth a read. Back to the resources. Here are a couple of images that I wanted to show in my presentation, but somehow forgot to include. 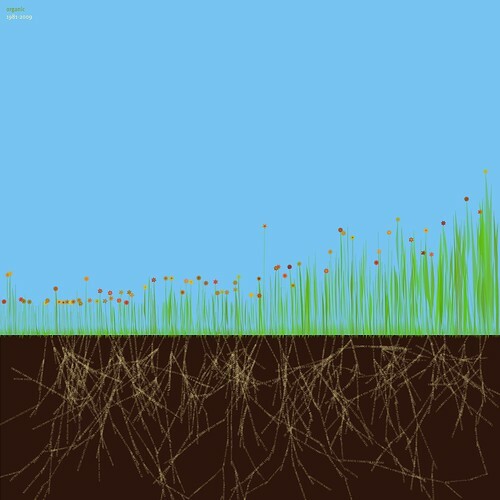 The first is an abstract visualization of the word ‘organic’ in the NYTimes between 1981 and 2009. 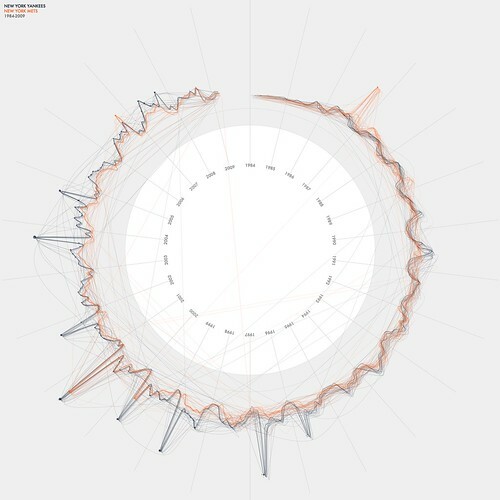 The second is a radial visualization of mentions of the Yankees & Mets in the same paper over the same period of time. Please let me know if there’s anything I’ve missed. As always, I’d love to hear any feedback and suggestions from those who were in the audience. I’m already looking forward to next year! Emergence refers to the way that complex systems and patterns arise out of relatively simple interactions. In this session we’ll look into some of the ideas behind emergence, and will explore in detail the role it plays in the creative process. We’ll talk about the effects of emergence in a variety of diverse areas, including economies, ecologies, and, of course, barrooms. Along the way, I’ll show a variety of new generative works which tread into emergent territories, and will unravel some of the underlying code that brings these projects to life. Flash on the Beach is actually in its second year, though this will be my first chance to attend. Held in Brighton, UK, the conference is attracting a big range of speakers, with Flash favourites like Brandan Hall, Mario Klingemann and Robert Hodgin being joined by some interesting outside speakers, like artist Jonathan Harris (wefeelfine.org). Word from the organizers is that there are only a few tickets left. Last year’s event garnered rave reviews from pretty much everyone involved – I am hoping that FOTB08 will bring more of the same. The new kid on the conference block is Flash on Tap. Yes, this conference is exactly what you (and I!) hoped it might be – a conference combined with a beer festival. The three day conference is scheduled with mornings of one-hour presentations followed by afternoon keynote sessions on the second and third day – the first day consists of workshops. On all three days there are beer-themed events in the evening – beer tastings, parties, and other events. Not surprisingly, the flash/beer combo has attracted a stellar list of speakers – though I noticed reading the bios that a few of the speakers don’t drink beer at all! Scandalous! Flash on Tap runs October 7th, 8th, and 9th. You can register for the conference on the website.